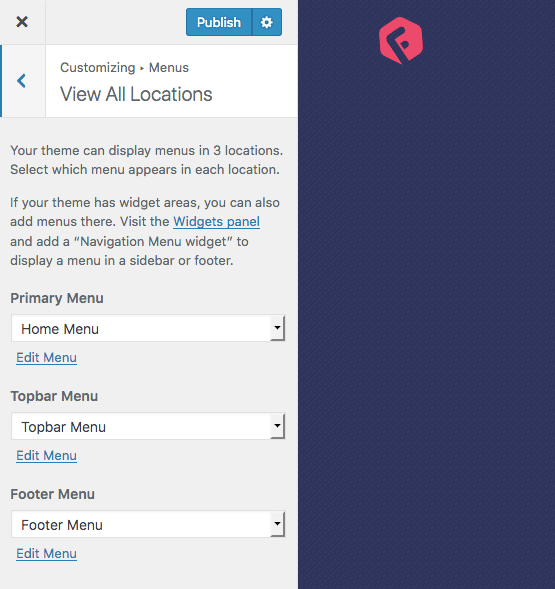 Flexia has three menu locations for Header, Topbar and Footer. You can customize the menus from Customize > Menus or from Appearance > Menus. Primary Menu will be shown on your Navbar which is the main navigation. It supports dropdown and responsive for mobile. It switches to mobile menu under 768px screen resolution. Topbar Menu will be shown on your Topbar that you can enable from Customize > Header. It is optional navigation you can disable the menu separately from Topbar if you want. It also supports dropdown and responsive for mobile. It switches to mobile menu under 768px screen resolution. Footer Menu will be shown on your Footer that you can enable from Customize > Footer. It is optional navigation you can disable the menu separately from Footer if you want. It doesn’t supports dropdown but responsive for mobile. Note that it won’t be a toggle for mobile like Primary or Topbar menus rather will be inline yet responsive for mobile. You can also set menus within any widget on any widget areas (Sidebar Widgets, Header Widgets or Footer Widgets).